1Do I have to pay to use the wedding planning tools? The 8 Wedding Planning Tools are absolutely FREE to use. Simply register an account on our website and APP. 2Is there a mobile application to access the tools? The Blissful Brides mobile application is now available on App Store and Google Play. The full set of Wedding Planning Tools are progressively released on the mobile application. 3What is the difference between a normal member and a VIP member? BB VIP Club is a paid membership providing special deals and discounted prices on packages from the vendors. VIP members will also receive invitation to exclusive workshops and enjoy complimentary dessert meal on their birthday month at Blissful Brides Cafe. 4Can I download the wedding day itinerary and seating plan? Yes, the Wedding Day Itinerary and Seating Plan are available to export to various file formats. 5What is the difference between a normal vendor and a premium vendor? Our Premium Vendors are carefully filtered and selected to provide the best products and services for Blissful Brides members. 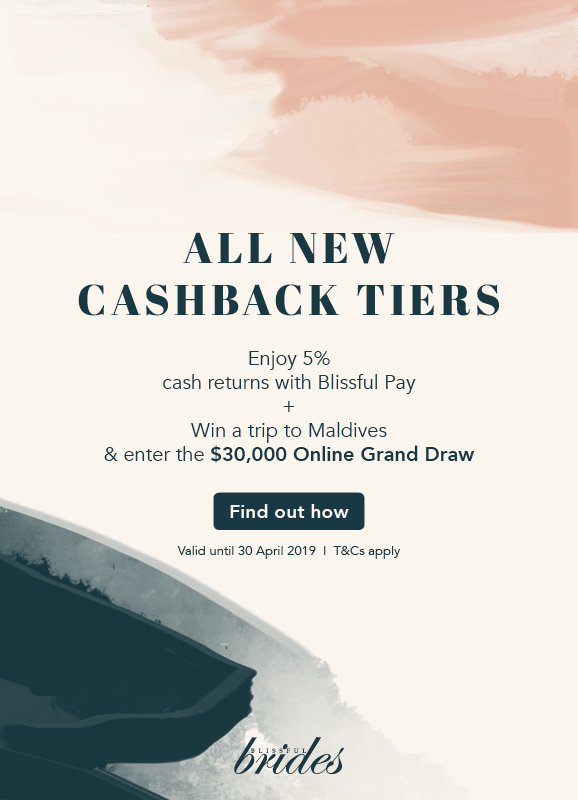 Also, stand a chance to win back your spendings in the $20,000 Cash Rebate Grand Draw and instant cash back up to $200* when you purchase a package from our Premium Vendors and pay online. 6What is the difference between Book Now and Pay Now? ‘Book Now’ is a step-by-step a booking process while ‘Pay Now’ is a 3-step express payment process. Select “Book Now” for a step-by-step booking process to discuss the package details with the vendors before confirmation and payment. Select “Pay Now” for an express payment after finalising the package details with the vendor. 7What are the special perks to purchase and pay on BB platform? ‘Stand a chance to win back your spendings in the $20,000 Cash Rebate Grand Draw and instant cash back up to $200* when you purchase a package from our Premium Vendors and pay online. 8How many vendors do you work with? We work with over 300 wedding vendors to provide a comprehensive range of wedding products and services. 9Are all the vendors local? All vendors are local unless otherwise stated. 10How do I get the instant cash back? 11How do I win the $20K Grand Draw? 12How can I pay for my package online? Payments are accepted via credit card, debit card and PayPal. 13What is the cancellation/refund policy? Kindly get in touch with the vendors directly. 14What should I do if I want a customised package that is not listed? Simply select a similar package and the vendor will get in touch with you to discuss and finalise the package details before confirmation and payment.